A spokesman for Sen. Joe Manchin (D., W.Va.) provided a false statement to a West Virginia newspaper in an attempt to cover up the senator's ties to a property company that owes hundreds of thousands of dollars in unpaid taxes. The State Journal reported late last week that Mountain Blue Hotel Group, which is partly owned by AA Property, LLC, is facing a lawsuit for defaulting on a loan and accruing nearly $600,000 in unpaid taxes. The article originally stated, accurately, that Manchin and one of his longtime associates Larry Puccio were identified in the Aug. 8 complaint, a copy of which can be viewed here, due to their ownership stakes in AA Property. 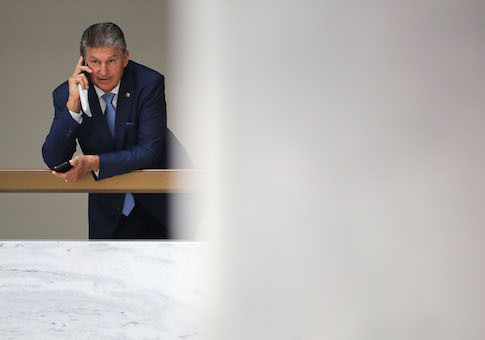 A spokesman for Manchin contacted the article's author, Linda Harris, to contend that Manchin and Puccio had no connection to AA Property or Mountain Blue Hotel Group. 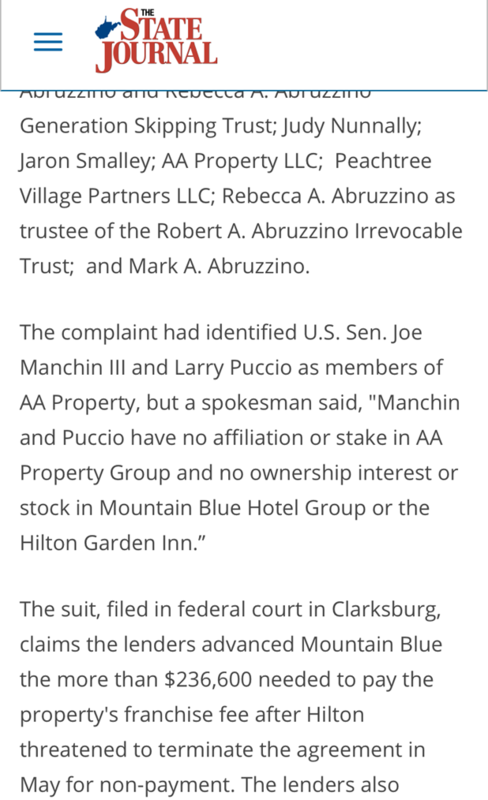 "Manchin and Puccio have no affiliation or stake in AA Property Group and no ownership interest or stock in Mountain Blue Hotel Group or the Hilton Garden Inn," said a statement from Manchin's spokesman that was added to the article. The statement from Manchin's spokesman, who was left unnamed by Harris, contradicts Manchin's most recent financial disclosure, which states that he owns between $50,001 and $100,000 in AA Property. The disclosure was amended by Manchin on Aug. 8, the day the lawsuit was filed, to increase his 2016 income from AA Property from $11,000 to $11,200.18. Manchin has disclosed his stake in AA Property since he joined the Senate. Puccio is currently listed on company filings as its manager. Manchin's communications director Jonathan Kott admitted to the Washington Free Beacon that his initial statement to Harris was incorrect. "After looking further into the paperwork, Senator Manchin has part ownership in AA, but AA has no ownership or affiliation with the hotels," Kott wrote in an email. "We clarified our statement with the State Journal." After receiving Manchin's "clarified" statement, Harris removed the mentions of Manchin and Puccio from her article. The article does not indicate that the text has been updated. Harris did not respond to requests for comment on why Manchin was removed from the article. Puccio is a widely known Democratic operative in West Virginia who has worked closely with Manchin for years. He served as Manchin's campaign manager during his successful run for secretary of state in 2000 and both of Manchin's U.S. Senate races. Puccio also served as Manchin's chief of staff before being elected as chairman of the West Virginia Democratic Party in 2010. Puccio and Manchin both have ties to the pharmaceutical company, Mylan, Inc. Puccio is listed as a lobbyist for Mylan, and Manchin's daughter Heather Bresch currently serves as the company's CEO. Mylan has contributed almost $400,000 to Manchin and his political action committee. The lawsuit against Mountain Blue Hotel Group came from a bank that claims the company failed to live up to its loan requirements for a West Virginia Hilton Garden Inn. This entry was posted in Politics and tagged Joe Manchin. Bookmark the permalink.